Regular readers of the NT Blog will be familiar with my occasional notices on how the Farrer Theory often gets ignored in scholarship. The attempt to make the Griesbach Hypothesis the sole alternative to the Two-Source Theory gives scholars an easier ride, especially in introductory works, in which the establishment of Marcan Priority becomes an argument for the existence of Q. The latest example of the phenomenon is found in Grant R. Osborne, Matthew (Zondervan Exegetical Commentary on the New Testament; Grand Rapids: Zondervan, 2010): 35-8, a preview of which can now be read online. Osborne says that "now there are two major camps".. The first is the "Griesbach Hypothesis" and he goes on, "there are stronger arguments for Markan Priority, especially the form called the "two- or four- source" hypothesis formulated by B. H. Streeter, which says that Matthew and Luke used Mark and Q as well as their own special material (M and L)" (36). Osborne then provides four arguments for Marcan Priority (36-7) and concludes "All of this makes it likely that Mark was the first Gospel and that Matthew and Luke used Mark as well as Q" (37). None of the arguments is in fact an argument for Matthew's and Luke's independent use of Mark, and so the conclusion that Marcan Priority necessarily leads to acceptance of the Q hypothesis is illegitimate. Osborne briefly mentions the Gospel of Thomas as providing an analogue for Q, without exploring the important question of the apparent generic contrasts between the two and he adds that "recent work has made the likelihood of Q more viable" (37), footnoting Carlston and Norlin's 1999 article on statistics and Q. That article certainly points in the direction of a Q document on the assumption of the independence of Matthew and Luke, but it does not speak to the issue of Luke's familiarity with Matthew. I am now so used to this kind of by-passing of the Farrer Theory that fresh examples come as no surprise. I have in fact come to expect it whenever I open a new book. I must confess to a touch of additional disappointment in this case, however, given my careful review of a book to which Osborne contributed, and concerning which we had corresponded, in which I spoke of the problems that arise from ignoring the Farrer theory and discussing the Synoptic Problem solely as a question of the Griesbach Theory vs. the Two-Source Theory (Mark Goodacre, Review of David Alan Black and David R. Beck (eds. ), Rethinking the Synoptic Problem, NovT 49/2 (2007): 197-9). I have been doing some more reading recently on Romans 16.7, the verse in which Paul greets Andronicus and Junia, "prominent among the apostles" (NRSV). (Cf NT Pod 12: Junia: the First Woman Apostle? ; Programme Notes and Andronicus and Junia prominent among "the apostles"). In revisiting the article by Burer and Wallace (Daniel Wallace and Michael Burer, "Was Junia Really an Apostle? : A Re-examination of Romans 16.7", New Testament Studies 47 (2001): 76-91), I was struck by their use of the phrase "biblical gynaecology" (76 and 78). The term seems quite inappropriate to me. Gynaecology is the branch of medicine that deals with functions and diseases peculiar to women (OED). In so far as there is "biblical gynaecology", I suppose that the material that would come closest would be the mention of the womb and breasts in Luke's Gospel (Luke 1.41,44, John the Baptist jumping in Elizabeth's womb; Luke 11.27-28, "Blessed is the womb that bore you . . ." and Luke 23.29, ". . . Blessed are the barren, and the wombs that never bore"). But this is not what Wallace and Burer are discussing in their article. Rather, they are discussing the gender of the name Junia, and asking also whether she was indeed an apostle. This is not gynaecology, Biblical or otherwise. The issue of the role of women in the church has become so central to how many Christians think that it even deserves its own theological label. Frankly, the best expression to use is “theological gynecology,” or “the doctrine of gynecology.” Too many associations with the medical profession will prevent some from seeing how appropriate this is at first. But ‘gynecology’ simply means ‘the study of women.’ And ‘theological gynecology’ means ‘the theological study of women,’ or ‘what the Bible says about the role of women.’ So I’ll use it sporadically throughout this paper. But gynaecology does not "simply mean 'the study of women'", even if that is the etymology of the word. It has a specific reference to the medical profession and to issues connected with female reproductive organs. Rather than seeing "how appropriate this is", a moment's reflection confirms how problematic it is, especially if one is aiming at a discussion that does not unduly prejudice the interpreter before one has examined the texts. It is difficult to see how it can be helpful to use terminology that risks reverting to androcentric stereotypes in which a woman's identity and function is viewed solely in terms of reproduction. I must admit that I don't even feel comfortable with this discussion being cast in terms of "the study of women" in Paul. Rather, it's about the study of men and women in Paul. That might sound like a fine distinction, but I think it is important. Casting the debate in terms that focus specially on the status of "women" in Paul's letters tacitly assumes that maleness is the norm, the expected standard for authority and status that is challenged by apparent exceptions like Junia. The same scholars do not speak with surprise about "andrology" every time a male authority figure appears in the text. The very problematizing of the female figure of authority as if it is in some way abnormal or surprising already casts the debate in terms that prejudice the outcome. I am really shocked to read on April DeConick's blog of the untimely death of Esther de Boer. She was a fine New Testament scholar and her work on Mary Magdalene in particular made a very important contribution to scholarship. I always found her a very positive and encouraging person too. She will be greatly missed. It is an apostolic response to ethnic problems in those churches, and it is a “bread-and-butter” letter written in advance of his arrival, seeking support for his mission to Spain. A crisis brought most Pauline letters into existence. Even Romans, written to a church that Paul’s preaching did not establish, is a “bread-and-butter” letter written in advance of his journey, seeking support for his mission to Spain (cf. 15:22-24). Ephesians, however, lacks clues concerning a concrete crisis or occasion. It is asserted that Matt 26:68|Luke 22:64(|Mark 14:65) is the most difficult of the minor agreements. Some advocates of the two-source theory have addressed this minor agreement by trying to make sense of the narrative as we have it, and others by making sense of the text as we have it (arguing for textual corruption or lost recensions). While some of these arguments are reasonable, in the final analysis they are not satisfying. Although we might remain persuaded that the two-source theory best integrates the data relating to the synoptic problem, this minor agreement reminds us that the synoptic problem is still a problem. Black's article provides a useful and balanced discussion of the issues, even if he is inclined to be more sympathetic in his assessments of the arguments of Two-Source Theorists than I would be. I have a few comments on the article, several of which come out of my own discussion in The Case Against Q. (1) Black uses the English translation “Who is striking you” throughout. Although this coheres nicely with the idea that it is a "striking" Minor Agreement, I think the translation a little unusual given the aorist participle -- τίς ἐστιν ὁ παίσας σε;, usually "Who is the one who struck you?" (2) Black notes Goulder’s contrasting explanations on the Minor Agreement, but treats them in reverse order (p. 329: “Elsewhere, Goulder suggests . . .”). His later explanation in "Two Significant Minor Agreements (Mat. 4:13 Par. ; Mat. 26:67-68 Par. )," Novum Testamentum 45/4 (2003): 365-373 represents his mature, final position on the Minor Agreement and should be given priority in discussion. (3) I argue in The Case Against Q (159-60) that Mark is here typically dark, enigmatic and ironic. The abusers are in the middle of fulfilling Jesus' prophecy as they taunt him to "Prophesy". Matthew attempts to explicate the Marcan enigma, and so to dilute Mark's dark irony, by adding "Who is it who struck you?" in a way characteristic of the evangelist. (4) I also suggest (Case Against Q, 159, n. 26) that the parallel in the Gospel of Peter 3.9 is helpful -- here they spit into Jesus' eyes in a way that provides a helpful commentary on Matthew's spitting into the face. It illustrates that the lack of the covering of the head in Matthew is unsurprising. (5) The covering of the face in Mark (καὶ περικαλύπτειν αὐτοῦ τὸ πρόσωπον) is easy to understand once one notices the parallel in Cicero, Pro Rabirio 13 (Capvt obnvbito) and 16 (obductio capitis). Here, the covering of the head is a key prelude to the ignominy of crucifixion. The covering of the face in Mark is not about blindfolding and second sight but about covering and shame. On one level Kloppenborg is making an important point, offering a sober reminder to scholars of the Synoptic Problem that Nestle-Aland27 offers at best only an approximation to the original texts of the Gospels. The sophistication of the critical text can all too easily seduce scholars into imagining that they are dealing with something far more concrete and stable than is in fact possible. But the relationship of our text-critical uncertainties to the question of the Minor Agreements by no means inevitably resolves itself in favour of the Two-Source Theory. There is a difficulty here that is rarely, if ever, recognised in the literature: that while textual corruption may indeed have generated Minor Agreements, it may also has eliminated Minor Agreements. Thus the impossibility of reconstructing “with absolute precision the Greek text of any of the gospels” and our ignorance concerning “the transmissional processes by which one gospel came to be used by another evangelist” does not necessarily tell in favour of the Two-Source Theory. It is just as important a theoretical possibility that the transmissional processes, and the history of the manuscript tradition, might have limited the number of Minor Agreements we now see in our Critical Texts. Indeed one might say that the clear and well-known scribal tendency to harmonise Mark’s text towards that of Matthew may have significantly lessened the number of significant Minor Agreements we now see. It is quite right, in other words, to bear in mind our uncertainty about the early stages of Gospel transmission when reflecting on the Synoptic Problem. But to appeal to this uncertainty as a means of dealing with the Minor Agreements is to appeal to the unknown in an attempt to avoid a stumbling block for the Two-Source Theory, an unknown that might just as plausibly reveal further and not fewer problems for the Two-Source Theory. Unless there are strong grounds for thinking that the absent evidence would indeed tell in favour of the Two-Source Theory, which there are not, the appeal to the absence cannot forward the debate. The Biblical Archaeology Society announces the 13th annual Bible and Archaeology Fest in Atlanta Georgia where 20 scholars will present the latest research on topics such as early Christianity, Gnostic scholarship, the Hebrew Bible, and more. Renowned speakers such at James Charlesworth of Princeton Theological Seminary, Bart Ehrman of the University of North Carolina, Mark Goodacre of Duke University, Craig Evans of Acadia Divinity College, Ben Witherington III of Asbury Theological Seminary and many more will be presenting participants with their latest research. September's Journal for the Study of the New Testament is now available. As usual, lots of material of interest. Abstracts available for all; full articles to subscribers. And bear in mind that there is free access to all Sage Journals until 15 October. Why Does the Deliverer Come έκ Σιών (Romans 11.26)? In a recent post on the Infancy Gospel of Thomas, I mentioned John Dominic Crossan's comparison of the child Jesus in the Infancy Gospel with Dennis the Menace. 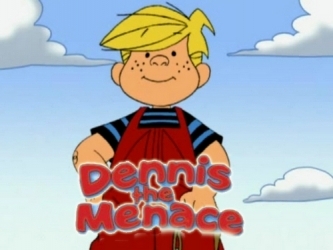 When I heard him say "Dennis the Menace", I instantly thought of the character pictured above on the left, Dennis the Menace from the British comic The Beano. 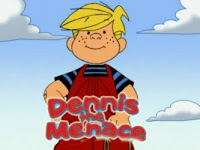 It occurred to me later that since this was an American programme, Banned from the Bible, broadcast on the History Channel, he was perhaps referring to the character pictured in the middle above, the American Dennis the Menace, who is almost exactly the same age as his British namesake, both first published in March 1951. But which one was John Dominic Crossan referring to? Both of them are mischievous young boys, but my ignorance of the American version makes it difficult for me to compare and contrast. 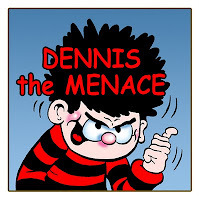 The British Dennis is undoubtedly a "brat", but which would Crossan have known? His time spent in both Ireland and America will have given him exposure to both versions, but I'd guess it's the American one he will have known best, perhaps especially if he has children, grandchildren, nieces or nephews over here. This group is exclusively a scholarly, theological, exegetical, hermeneutical, reflective, and open-minded one by combining both the past and present New Testament scholarship worldwide. It's an open, public group and there are already 407 members. Typo in Elliott's Apocryphal New Testament, on Infancy Gospel of Thomas? Again, in the time of sowing the child went out with his father to sow corn in their field. And as his father sowed, the child Jesus also sowed one grain of corn. 2. And when he had reaped it and threshed it, he brought in a hundred measures, * and he called all the poor of the village to the threshing-floor and gave them the corn, and Joseph took the residue. He was eight years old when he performed this sign. Update (Saturday, 13.25): In comments, Andrew Criddle notes that the word κόρος occurs both in Luke 16.7 (ἑκατὸν κόρους σίτου) and in Tischendorf's Greek A recension of the Infancy Gospel. 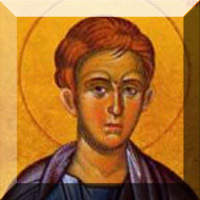 Moreover, κόρος is a hapax in the New Testament. That is clearly the point of the cross-reference in Elliott, so I withdraw my suggestion that it is a typo, even if it is a strange choice of cross-reference given the clearer content parallels with the Synoptics here and elsewhere that are not marked. Incidentally, a look at Tony Burke's Critical Edition of the text shows some interesting variation in the Greek witnesses at this point, κόρους ρ in his Gs, μέδιμνους ρ in his Ga and μόδια ἑκατόν in his Gc (Burke, 192-3). Update (Friday, 9.55): In comments, Tony Burke mentions that the clip above is from Banned from the Bible (History Channel, 2003). ‘Some were saying, “He is good”’ (John 7.12b): ‘Good’ Christology in John's Gospel? Abstracts available for all at New Testament Studies, and electronic access to subscribers. Nathan Eubank, "A Disconcerting Prayer"
The online access is only available for SBL subscribers and for institutions with subscriptions to the JBL. This year's British New Testament Conference began yesterday in Bangor. I have had to miss the BNTC for the last five years since I moved to the US and it always feels a bit odd not to be there. I was heavily involved with the organisation for several years, as the secretary and treasurer of the society, and I regret that I had only one chance (2005) to go along as a punter before moving away. Knowing that several bloggers are present, I am looking forward to hearing some reports. Jim Davila is a stalwart of the conference and will no doubt have reports for us; the new Sheffield Biblical Studies blog is already blogging on the ground, though without specific attribution (after the initial post from James Crossley); and Helen Bond mentions the conference on the new Centre for the Study of Christian Origins blog. If you are wondering what has happened to the NT Pod recently, I have been unable to record because my Snowball has gone on the blink. Recordings have a high-pitch noise. So I am moving over, for the time being at least, to recording in Duke's gret facilities. As it happens, these facilities are so good that I may continue to use these even after I have sorted out my microphone problem. So there should at least be a new episode next week, once I have worked out all the finer points of using the Duke facilities. Bear in mind that in our area that includes journals like the Journal for the Study of the New Testament and Expository Times. NT Blog Seven Years Old Today! I've been inspired to set this up by Jim Davila's fine Palaeojudaica weblog at http://paleojudaica.blogspot.com/, not least because of a comment he made in that recently that it would be helpful to have more people doing the same kind of thing. I've very much enjoyed reading his blog over the last few months and while I doubt I will be able to do as good a job as he, I am nevertheless encouraged to try something similar myself. Well, Jim's still at it, I'm still at it, and now there are lots more people too, as well as many others who have come and gone. For the first five and a half years of this blog, I was blogging under the NT Gateway banner, but now, as I hope you know, that has a blog of its own where I post along with Holger Szesnat, mainly on new internet items of interest that appear on the site. So this is the first full year of the morphed NT Blog and I continue to work on my NT Pod too, a podcast that now has forty episodes and is just over a year old. Thanks for the continued encouragement and support for these seven years. Here's to the next seven! It includes an article by Jeff Staley on The Crucifixion of Jesus in Films and in the Gospels which looks well worth a read. Thanks to Jim Dvorak for pointing out that article to me. I am proud to say that I actually remembered and got round to nominating several posts this time around. Meanwhile, several have the good news that the University of Sheffield Biblical Studies Department has a new blog. For those interested in who has the most popular Biblical Studies related blogs at the moment, Free Old Testament Audio Website Blog has the latest. And while we are on the subject, I was disappointed to notice recently that the Biblioblogs.com website had gone down. It looks like the domain name was not renewed, and the content has all gone, at least for now, which is a shame.